BMW Team RLL also cruises on to second straight victory while MSR's Katherine Legge makes her move for GTD glory. Just days after announcing that he will relocate to Action Express Racing at the end of this season, Pipo Derani led the charge for Tequila Patron ESM at Laguna Seca to earn the crew's second IMSA victory of 2018. Sunday's contest at the Californian track featured a plethora of position changes and other drama, particularly in the top-level Prototype class, which got the action rolling early. A crash during the race start saw IMSA WeatherTech Championship contenders Mustang Sampling Racing get knocked out while simultaneously collecting others in the GT Le Mans and GT Daytona categories. This kicked it off under a yellow flag and set the tone for what would be a fender-banging battle on the slippery, sun-baked track surface. Polesitter Wayne Taylor Racing faced issues early as well and surrendered the lead to the rapid pair of Team Penske Acuras who were with the pace all afternoon. They would be tightly contested by Mazda Team Joest's No. 55 entry which, for most of the race, looked to be headed for its first win of the year. However, when driver Harry Tincknell approached lap traffic in the closing stages, he was spun and relinquished the lead to the charging Derani who quickly built a gap at the front of the field. While the No. 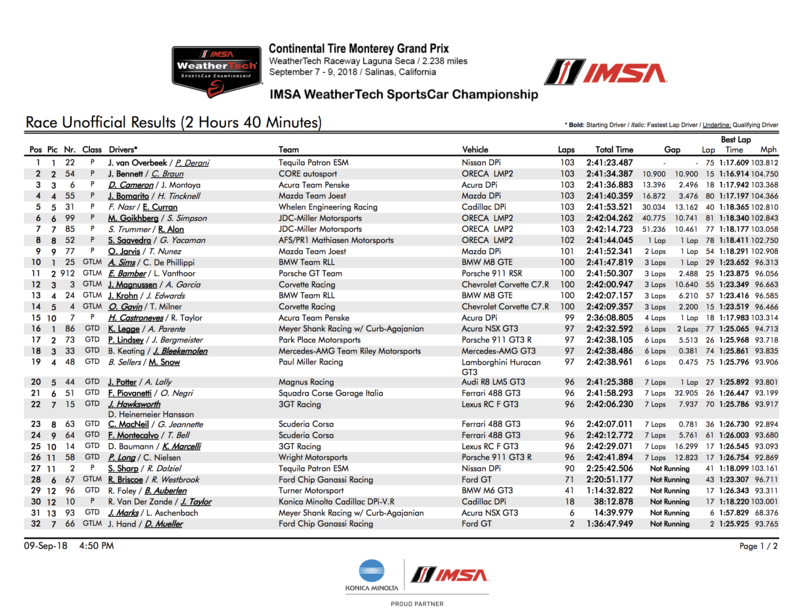 22 Nissan Onroak DPi was coasting to victory, the battle for second was heated as CORE Autosport's Colin Braun clashed with Penske's Ricky Taylor with three minutes remaining. Braun eventually nudged his way ahead in the No. 54 Oreca 07 Gibson, continuing his second-half tear and gaining valuable championship points in the penultimate round of the season. Alexander Sims and Connor De Phillippi maneuvered their way to BMW Team RLL's second consecutive GTLM win after coming out on top at the recent GT-only round hosted at Virginia International Raceway. The No. 25 BMW M8 GTE crew was able to manage strategy and fuel mileage on its way to the W, besting the ever-dominant Corvettes around Laguna Seca while also edging out Laurens Vanthoor's No. 912 Porsche. The No. 67 Ford GT of Chip Ganassi Racing dropped back in the standings as drivers Ryan Briscoe and Richard Westbrook suffered issues and completed just 71 laps to Team RLL's 100. The duo now sits behind Corvette Racing's No. 3 tandem consisting of Antonio Garcia and Jan Magnussen who currently lead the title hunt. Meyer Shank Racing ace Katherine Legge cut the points deficit to Paul Miller Racing's driver team in half on Sunday moving into the final race of the year at Road Atlanta. The seasoned sportscar driver teamed up with Alvaro Parente in the No. 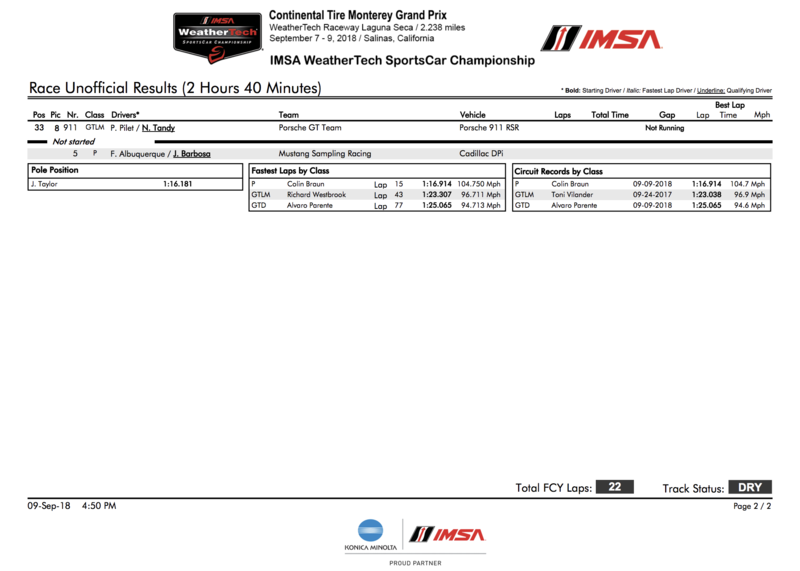 86 Acura NSX GT3 to achieve class victory around the 2.238-mile circuit. A late-race pass of Park Place Motorsports' Jorg Bergmeister put Parente in position for the win and catapulted the outfit to the podium's top step. Mercedes-AMG Team Riley Motorsports' No. 33 entry rounded out the top three in GT Daytona.